When we arrived at the yard the office was closed, but we had seen fork lifts moving around as we’d approached on the tow path. Jonathan came up to say hello, he was just about to move a shell into the bottom workshop so he’d be with us shortly. 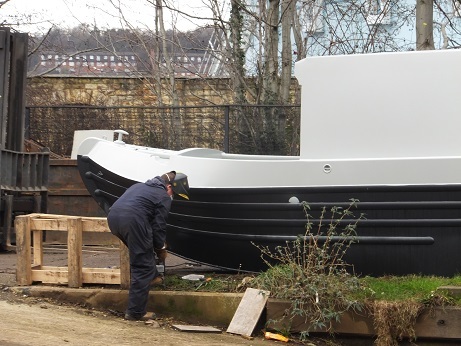 We were more than welcome to look at the two boats in the fit out workshop, admittedly both were Josher bows, but had bow thruster lockers, so we could check if the bikes would fit. No way would the bike get in there! A carpenter, Jeremy turned lights on inside one of the boats so that we could have a look. 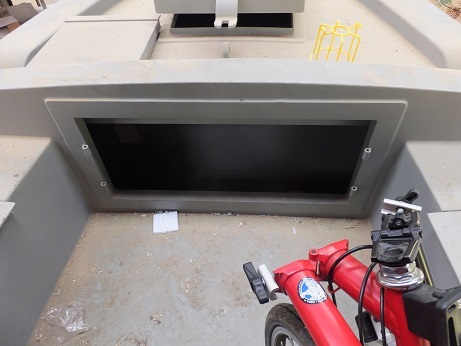 The bow thruster lockers had access via a vertical opening, which would mean angling our bikes in through the opening to get them into the main body of the locker. This was not possible, the bike was too wide for the diagonal. We checked what height there was above the motor on the bow thruster and this was not big enough. Elsewhere there was plenty of space, but not enough for two bikes and any way you couldn’t get them in to start with. Quite a feature in your galley. We went inside and had a look at the fit out that was on going. A reverse layout as we will be having. 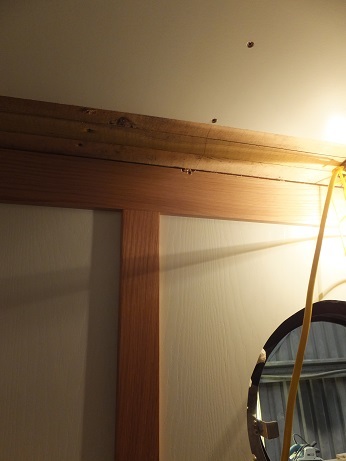 The ceiling and above the gunnels were white with oak trim. I noticed that the white panels where on two different surfaces. 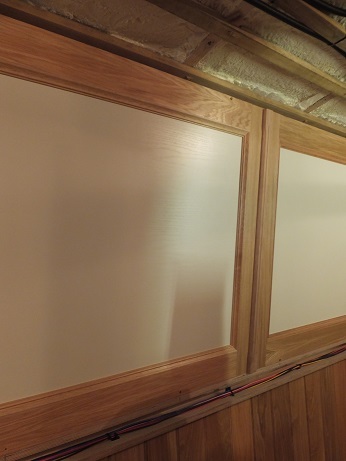 Birch and Oak veneer. The ceiling will be lit from the sides with LED lighting cast across it, so the owner had asked for a plainer finish here, the birch. On the walls was the oak, which in parts had too much grain for me and I would think that the paint had run, even if it hadn’t. 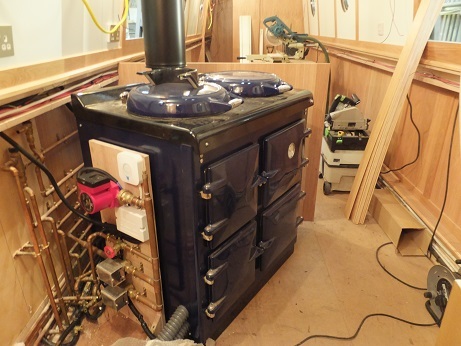 In the galley there was a large Heritage stove diesel fuelled. Boy it was big. The double insulated flue was wide and with the calorifier perched in the corner behind it, it certainly was a feature! Nosing around the galley we got chance to measure where the swim affects the rear of what will be our galley. 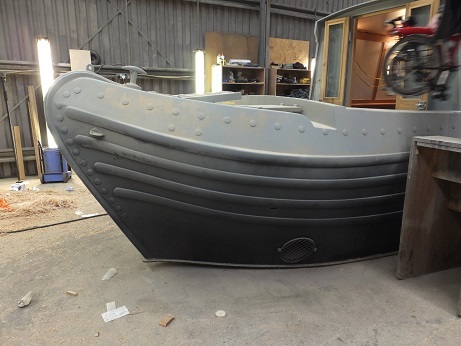 The swim curves inwards to the prop below the water line and whilst planning the layout of Oleanna’s galley I’d forgotten just how far it comes. 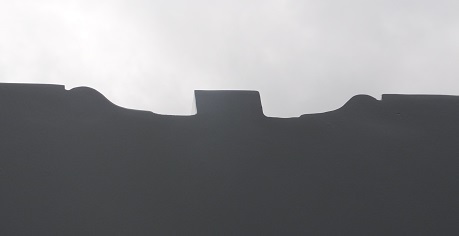 At the rear bulk head it is 8 inches wide, reducing to 2 inches at 2 ft and by 4 ft away it flattens out. Ah I’d positioned a fridge in the last 2 ft! That would have to move elsewhere. The other boat was also a Josher with what looked like a standard layout. 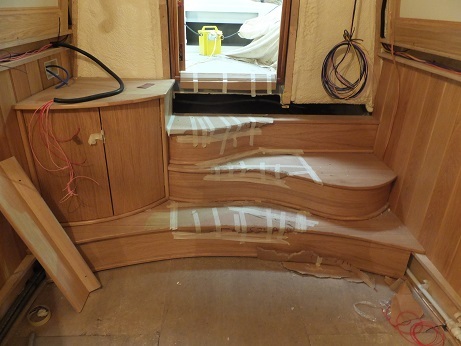 Curvey steps brought you down into the saloon, followed by a pullman dinette, galley, bathroom. 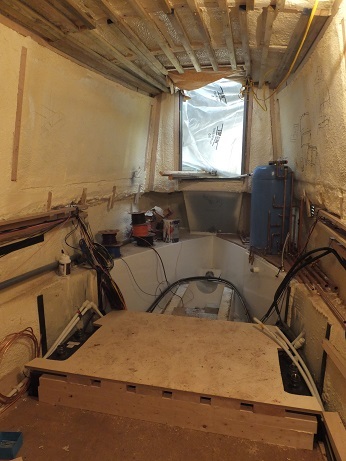 Beyond this was the engine room, which was still all spray foam, cables etc. The lining was fancier with extra beading. By now Jonathan had joined us and discussions as to where our bikes could live began. When we had last visited there had been a different style of bow thruster locker on a trad bow that you accessed from above, horizontally. Our thoughts at the time were that the bikes would easily fit. 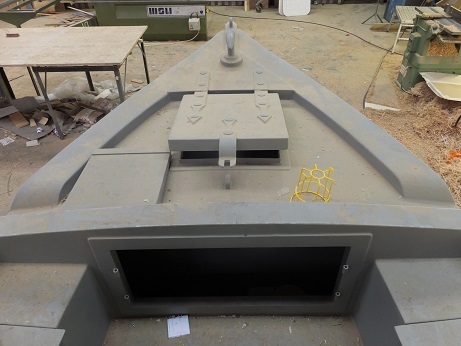 In the bottom workshop two hulls were having their paint baked, one of which had such a locker. The bike easily fitted in through the opening, but the depth was the problem, 11 inches too shallow. Several other options were discussed, but they would affect the lines of the boat and what is the point of that. Maybe the stern lockers. Back to another boat. With lockers extended to right behind the back cabin doors we would just get enough width at this end, but not enough elsewhere. A re-think needed, maybe loose a bike, find a cupboard inside to accommodate them, incredible shrinking/growing machine (I really must patent that!). 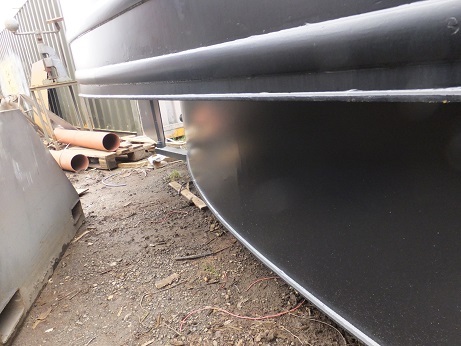 Back to the bow shape and how much space bows and sterns take up. 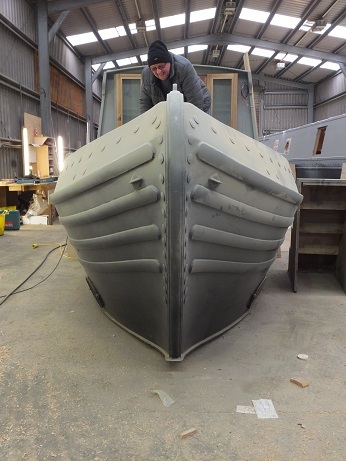 Jonathan confirmed that a Josher has at least a 10 ft bow, a Trad bow 9 ft. A semi trad stern needs to be 7 ft 6 inches with the back deck being 3 ft 5inches. With all our questions answered and measurements taken the decision on bow style was the last thing. My photos don’t quite do the bows justice. 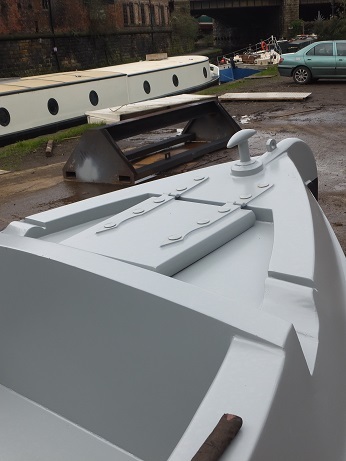 A trad bow has very pleasing lines, gives us an extra foot of cabin space, but reduces the well deck. A Josher is prettier with more curves, reduces the cabin space, but gives more well deck. 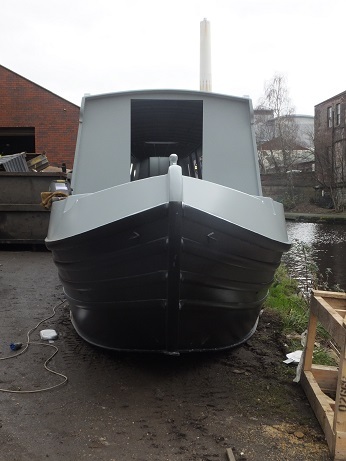 Our heads have won and we will be going for a Trad bow at 58 ft 6 inches, internal space being more important. This entry was posted in Uncategorized on 27th Jan 2016 by pipandmick.